Oakmoot cottage is the newest cottage on Beachgrove Island and, named after the grove of oak trees in which it stands, and 'moot', an old anglo-saxon word for a meeting for debate or discussion. Getting together for lots of talk is what we do at Oakmoot. Built and finished over the years from 2005 to the present, it is the spiritual centre for the Ashley family: Susan (neè Wright), Rob and children Charlotte, Lauren, Camille, Gordon, their various partners and children, and of course granny (Libby) Wright. Anyone seeing Oakmoot for the first time is usually struck by the banks of solar panels on the roof. 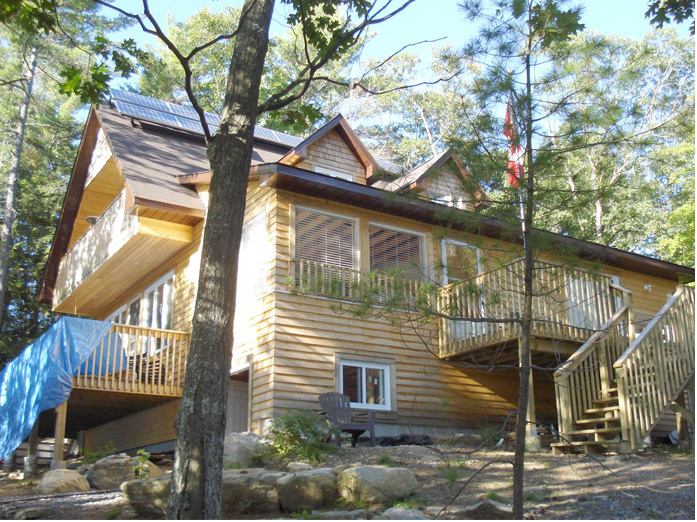 Robert had researched alternate and 'green' energy options for many years and he and Susan wanted to build an energy-conserving cottage. They ensured that insulation and vapour barriers were better than R-2000 standards. 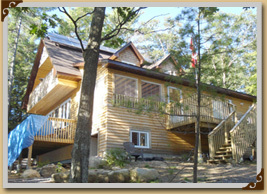 Today, the cottage is truly off-line, having no connection to hydro lines and with phone, internet and TV coming in wirelessly. The cottage is built along an east-west line, with a 60 degree sloping roof facing south to wring as much solar energy from our central Ontario sunshine as possible. Rocks play a big part in the story of this cottage. Oakmoot is founded right on the bedrock of the Canadian Shield. Although the major job of foundation, framing and roof were done by local builder Gary Ford of Milford Bay, Oakmoot was then finished through many summers of hard work by the family itself. Although rock is a fact of life everywhere on Beachgrove, the siting of the cottage was largely determined by two specific rocks: "Edgar's Rock" and "The Big Rock". 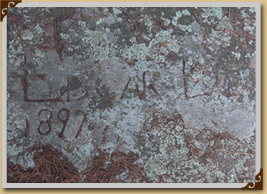 Edgar's Rock commemorates Frederick’s son, Edgar Street Denison, who died in the First World War, with an inscription carved into the smooth, glaciated bedrock near the water along the west shore. Edgar was serving with the Princess Pat’s infantry when he was killed Apr 23, 1915 at the age of 36. Susan remembers cleaning fish along the shore here and probably it had been this way for generations. There still is an old stone staircase leading from the Bay that they used to climb to take their fish over to that side of the island. It seemed like a good idea to keep the guts and smell away from the old cottage in the Bay where they stayed. The Big Rock back from the shoreline was a favourite perch for Susan when she was a child. 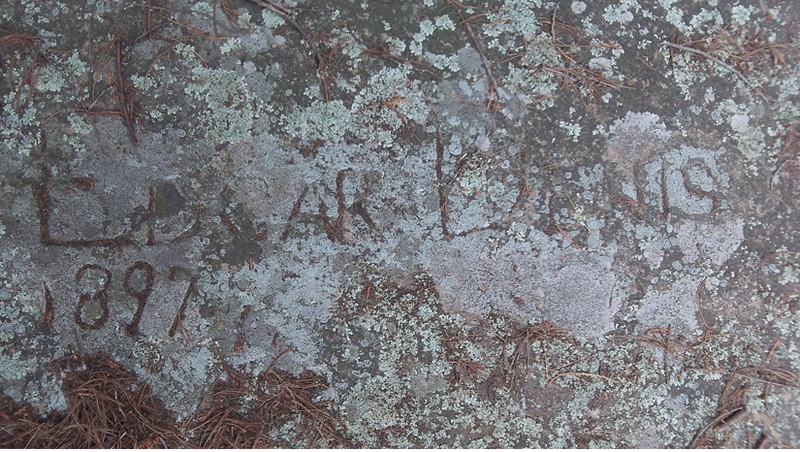 Neither this rock nor Edgar's Rock could be desecrated in any way, so Oakmoot cottage is sited between the two. There was a time when this approximate location was also considered by Gord and Libby Wright for a cottage. Today, Libby has a specially-built 'granny' wing at Oakmoot. The history of Oakmoot is just beginning, but it has already seen many happy and fun moments for the Ashley clan and their guests.